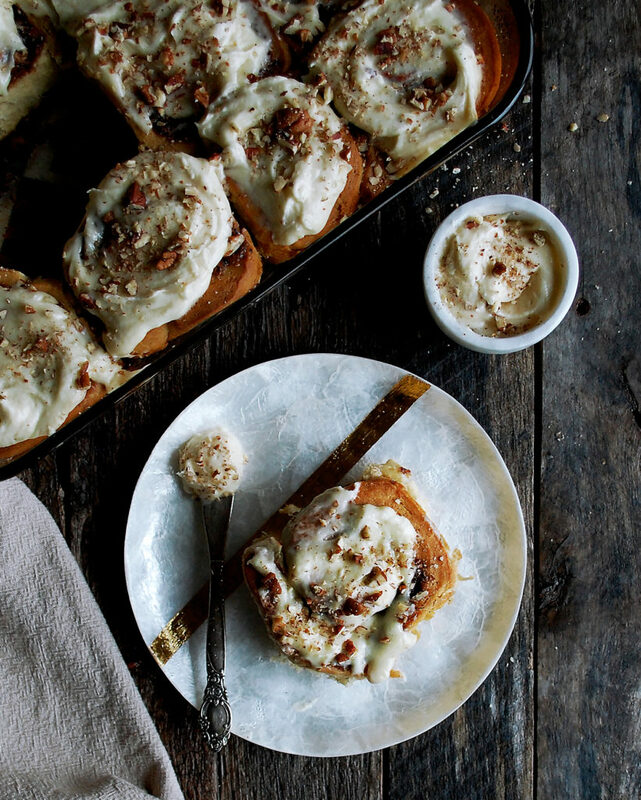 These Brown Butter Cinnamon Pecan Rolls with Cream Cheese Frosting will make your weekend dreams come true. I don’t know about you, but nothing sounds better to me than a weekend of slow mornings and delicious breakfast baking. 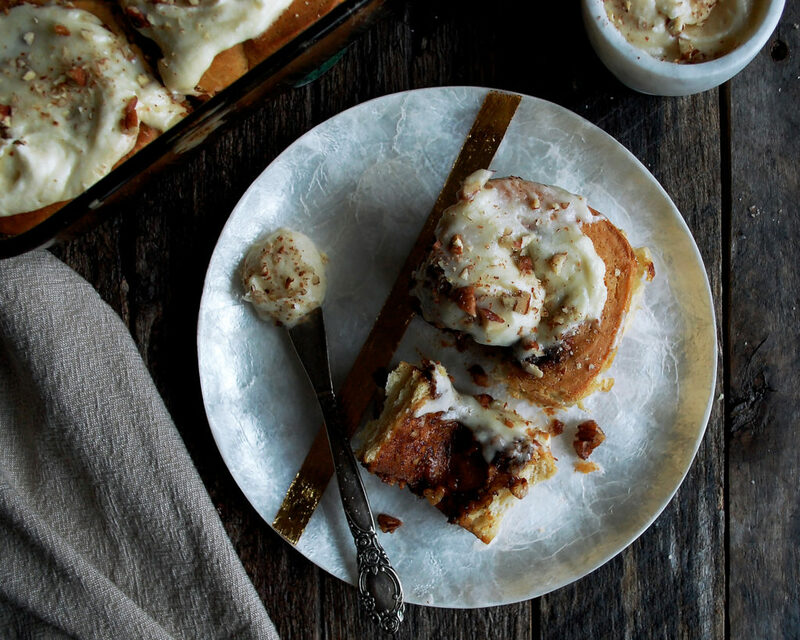 And of course, what better thing to whip up for the ultimate comforting morning than cinnamon rolls!? These are soft, buttery, and full of delicious nutty brown butter flavor, sweet brown sugar, toasted pecans, and classic cinnamon. 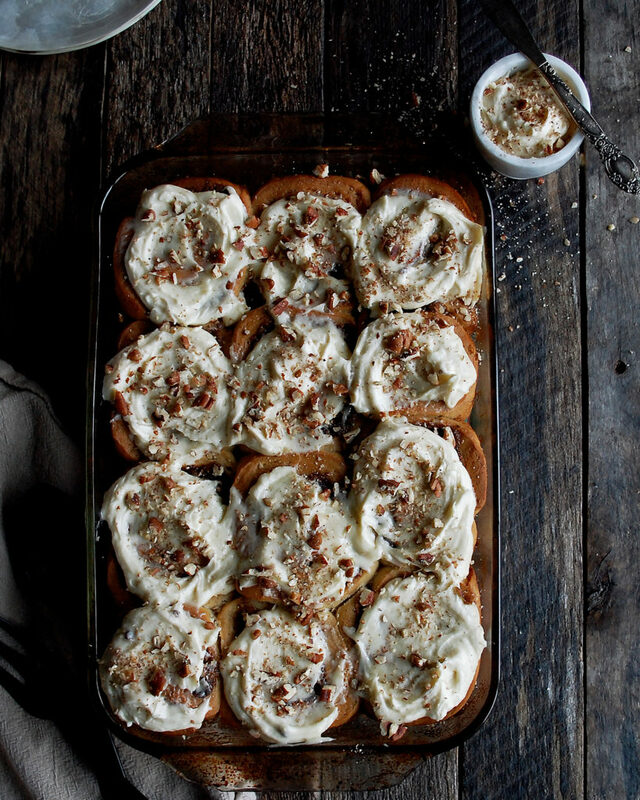 Plus, a cream cheese frosting…to be slathered onto the warm cinnamon rolls as soon as they come out of the oven. YES. Baking cinnamon rolls involve making a yeast dough that needs to rise, twice. But don’t be intimidated by this. The key is to proof the dough in a warm place and to have a good amount of patience. That’s why I typically would only make cinnamon rolls on a morning I have a good amount of time, so most likely always a weekend. 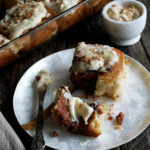 The dough gets mixed, kneaded, covered to let rise for 1 ½ hours, rolled out, covered with a buttery brown sugar and pecan filling, rolled into a log, cut, placed into a pan, covered to let rise for another hour, baked, topped with cream cheese frosting, and eaten. A process, yes, but totally manageable. And the end result is so worth it. I’d highly recommend serving these alongside a frittata if you’re looking to add some protein and vegetables to your breakfast as well. 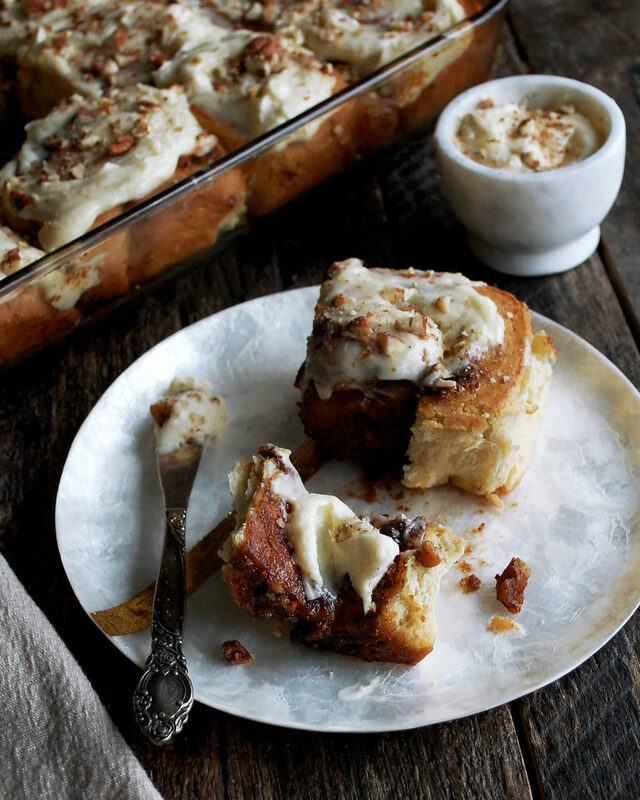 Or, simply enjoy the cinnamon rolls alongside a hot cup of coffee. I couldn’t think of a better way to start the morning. In a small sauté pan, melt the butter over medium high heat. Turn the heat to medium and let the butter continue to cook until brown and nutty smelling. 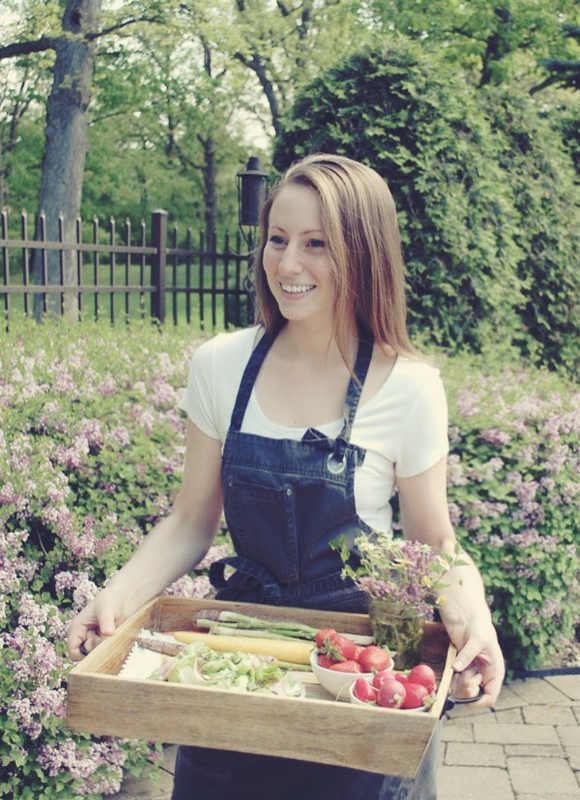 Let cool to room temperature. Add the milk and dry active yeast to the base of a stand mixer with the pinch of sugar. Let the mixture sit for about 5 minutes until the yeast starts to foam. If it doesn’t foam, start over. The yeast is most likely dead/expired; the milk may also have been too hot or too cold for the yeast to activate. Once the yeast begins to foam, add in the brown butter, brown sugar, egg, and egg yolk. Whisk until smooth. Stir in the flour and salt with a wooden spoon until the dough begins to form. Using a dough hook attachment, mix the dough until it fully comes together, about 5 minutes. Turn the dough out onto a lightly floured surface and knead for another 5 minutes. Grease a large bowl with a touch of oil. Form the dough into a ball and place in the bowl. Cover with a warm, damp cloth. Let rise in a warm place until the dough has doubled in size, about 1 to 1 ½ hours. Turn the dough out again onto a lightly floured surface and roll the dough into a large rectangle, about 9×12”. Spread the softened butter evenly across the dough. In a small bowl, combine the brown sugar, cinnamon, and pecans. Evenly distribute this mixture on top of the butter. Starting on the 12” side of the dough, tightly roll the dough into a log. Cut the log into 12 even pieces. Place the pieces into a buttered 9×13” baking dish. There will be a little space between each piece. Cover the dish with a warm, damp towel and let sit in a warm area for about 45 minutes to let the dough rise again and double in size. The dough should now fill the entire pan without spaces. Preheat the oven to 350F. Bake the cinnamon rolls for about 20-25 minutes until slightly golden, yet still soft and buttery on the inside. Meanwhile, add the softened cream cheese and butter to the base of a stand mixer. Using a paddle attachment, whip until smooth. Gradually add the powdered sugar until incorporated. Lastly, mix in the vanilla. When the cinnamon rolls come out of the oven, spread the cream cheese frosting over top immediately while they’re still warm. Finding a warm place is crucial for the dough to rise. If you happen to have a warming unit (I have one underneath my stovetop), you can turn the unit on to the lowest setting and allow your dough to proof in there. If not, near the stove typically works well or a warm place in your house. Oh my goodness! These look amazing! Pinning!